Sitting in your office desk, or while cleaning your same old house, or even while watching your favourite movie in the television, have you ever felt like packing up your bags and walking out the door to a place where life felt a bit different than the usual everyday life? Travelling is the best therapy one could use to get over your “FoMO”. Sometimes while trying to survive our routine life, we get lost behind our bank accounts. We miss out on so many things that we can take advantage of in this lifetime but all we do is sit behind our screens and scroll through our friend’s facebook accounts and wonder how great their life is. Well friends, its never too late. Your life will be the same when you come back, but for now just pack up your things and explore the beauty of God’s creation. For a change, visit the few places that are very less visited and show your travel loving friends what they have been missing. When it comes to travelling, Rajasthan is a highly visited place but how many times have you heard a friend of yours talk about Shekhawati. It is a region that brings together some beautiful cities like Sikar, Jhunjhunu, Churu, Nagaur and Jaipur. Shekhawati is known as the realm of beautifully architectured havelis and rich heritage. For all the art lovers who love old painted sculptures and architectures, this place will be your heaven. The place portrays the colourful rich life of the ancestors of the Shekhawati Rajputs who used to put so much artwork to beautify their homeland. Some of the places that you must visit to experience the ethnic Indian core culture are – Sethani Ka Johara, Kanhaiya Lal Bangla Haveli, Ratangarh Fort, Laxmangarh Fort, Sunset Point Moda Pahar and much more. So without wasting a minute book your tickets to experience the real royal Rajasthan. If serenity was an invisible blanket, then a thick one must have been spread across this beautiful valley. This hardly visited Gurez Valley lies just below the LOC between India & Pakistan. The beauty of nature embraces you the moment you enter the valley with the snow-capped mountains you can hardly find anywhere else. The wildlife in this area is also worth experiencing with animals like Himalayan brown bears and snow leopards. It is also said that fishery is one of the activity that is very popular around the area as the beautiful Krishnanganga river flows right through the valley. One of the famous attraction of this area is the Habba Khatoon mountain peak. So satisfy your senses in this lovely valley of Kashmir and embrace the serenity. For all the people who have religion and spirituality clinched to your soul, this place is the one where you would feel the presence of Lord Rama surrounding you in the entire island. This is known to be the place where Lord Rama built the bridge across the sea to Sri Lanka. The best thing about this place is that it is very less crowded than the other holy places. You can very easily visit this religious place and satisfy your soul to your heart’s content. Some of the must-visit attractions of this island are- the Rameshwaram Temple, the heavenly Dham near Pambam Bridge, Five Faced Hanuman Mandir that holds the floating stones, Agniteertham and much more. This weekend, feed your spiritual urges with this beautiful place. Known as the cleanest village in Asia, this place has set an example to the whole country. Amongst the hills and greenery around the place, just imagine how it would feel to go for a walk through this amazingly clean village. Also known as the “No Man’s Land” this place has left behind the patriarchal rule of the society and moved on by proudly accepting their mother’s surname. Some of the best tourist attractions of this place are- the Living Root Bridges that the UNESCO declared World Heritage Site, the beautiful view of India and Bangladesh from the Sky View Point, the Mawlynnong Waterfall and the 100 years old Church Of Epiphany. One more reason to visit this place is the Umngot River in Dawki that falls on the way to Mawlynnong. The river is known to be the unexplored paradise with the cleanest water you’ve ever seen. A boat ride in this heavenly river is a must in this trip. Experience something out of this world in this small remote village called the Velas Beach. Maharashtra is filled with beautiful beaches in all its corners but the best thing about this beach is the view of thousands of Olive Ridley turtle hatchlings at the same time. A Large group of turtles gather ashore to lay their eggs 40-45 days ahead of the hatchings and people from all over the world fly down to this beautiful beach to witness the extraordinary sight of the tiny hatching baby turtles making their way to the Arabian Sea. It is a sight to see and an experience of a lifetime. Make sure you make a plan soon. Usually you will find a lot of people packing their bags and travelling to Himachal Pradesh very frequently, but amongst all the popular hill stations, Spiti Valley is the one very less visited. With the breathtaking views of the hills and the scenic beauty creates a sensation within your soul that you will never forget. Buddhist monasteries and culture send out a peaceful vibe to your soul. Best attractions of this place are- Chandratal Lake, Surajtal Lake, Kunzum Pass, Dhankar Monastery and much more. Talk to those hills in the valley and find your voice within. A must visit place for trekkers and hill lovers. The Smallest Indian Territory of India, Lakshadweep, has some of the most beautiful beaches and islands. Visiting this place would actually feel like travelling far away leaving everything behind. The beauty of the islands here is that they are very less visited and thus it is not loitered by the dirt of crowd. People who love water sports would love this place to experience scuba diving. Also, the sight of beautiful sunsets and sunrises have the ability to wipe off all your anxieties from your old rotten life. Some of the best islands that you must visit are- Minicoy Island, Agatti Islands, Bangaram Island, Kavaratti Island and much more. Feel the waves and breathe the air of Lakshadweep as soon as you can. So people, without wasting any more time, start planning your trip to one of these amazing less travelled places and treat your soul for once. Take your life for granted and explore the world. Life isn’t going anywhere but time is. We’ll be back with more exciting blogs for you soon. Stay hooked! There comes a time when most of us need a well-deserved vacation. We want to chill out and enjoy ourselves, hopefully by traveling to an exotic locale that has gorgeous scenery, is a shopper’s paradise or has a party atmosphere. Within a few short hours’ flight are 5 exciting vacation spots where you can spend a few days and let your hair down. 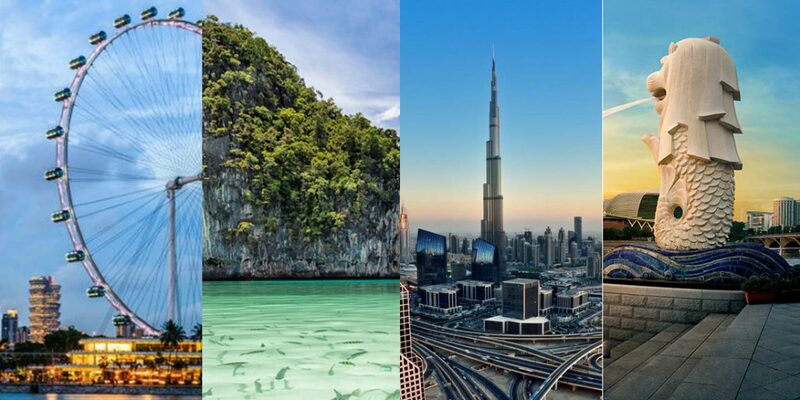 If you love skyscrapers you’ll love visiting Dubai, a city where one building is taller than the next and where the tallest of them all, the Burj Khalifa stands as well. Some other places you simply must visit in Dubai are the Dubai Mall with its 1,200 stores, an ice skating rink, a theatre, and a world famous water fountain light show that simply shouldn’t be missed by visitors to Dubai. When in Dubai, driving through the sand dunes surrounding Dubai in the comfort of an air-conditioned land cruiser is a must and makes for great conversation among friends’ back home. Additionally, you should explore the option of visiting another famous Dubai landmark, the Burj Al Arab, a world famous hotel with renowned restaurants. Our friendly neighbor to the south, the exotic island of Sri Lanka is also a great vacation destination. If you decide to visit Sri Lanka, your proximity to the sea will be a major attraction and reason to visit this island nation. If you want to engage in some adventure, then snorkeling at Weligama Beach may be just right for you. Sri Lanka is a highly forested island and offers ample opportunities to get in touch with nature, for instance, you can take a boat cruise along the Madhu River where to your left and right will be ample flora and fauna that will capture your imagination. Along the Madhu River lie numerous restaurants allowing you to sample exotic Sri Lankan cuisine. Another dream getaway destination is Singapore. Here you get to enjoy world-class amenities after traveling less than six hours nonstop by air. Some exciting things to do when in Singapore include a Night Safari where visitors have the chance to see how animals behave nocturnally. Visitors to Singapore insist that a journey to Sentosa Island is a must when in Singapore. At Sentosa island, you will have the chance to savor a yummy German Buffet and wash it down with the tallest glass of beer in the city-state of Singapore. There’s no better way to experience Singapore than by a ride on the Singapore Flyer which is a giant observation wheel on which passengers get a 360-degree view of Singapore and even, weather conditions permitting, see as far as Indonesia and Malaysia. One of the most popular tourist destinations among Indians is undoubtedly Pattaya. Pattaya is in Thailand and is a little more than an hours’ drive from Bangkok. For the adventuresome and fearless, Pattaya is your Mecca. However besides the pubs, discos, shows, beach clubs, massage parlors, and go-go bars Pattaya is most well-known for, there are a number of additional attractions for tourists to Pattaya. The Four Regions Floating Market is one such attraction and as the name implies is a floating market where products from all the four regions of Thailand are sold. A number of delicacies are sold here and an occasional art gallery and souvenir shop are also to be found here. Another attraction not to be missed in Pattaya is the Nong Nooch Tropical Garden which in addition to having gorgeous landscaped gardens has displays of Thai boxing, dancing, and drumming. On the west coast of Thailand lies Phuket. It has a spiritual essence and is ideal for those who want to vacation in a city that lacks a dedicated and highly touristy commercial atmosphere. The shows in Phuket are centered around storytelling and dance and a number of beautiful beaches such as the Kata Noi Beach are also found on the island of Phuket. These beaches should be paid a visit as they are scenic with water that’s ideal for swimming. The Phuket Big Buddha and the Tiger Kingdom are two additional attractions on this Thai island. At the Tiger Kingdom you get the chance to pet tigers, two of the friendliest and most popular tigers currently here are named Elf and Mong Kon. When you want to get in touch with your spiritual side in Phuket head on over to the Big Buddha, it’s over 45 meters tall, is exquisitely peaceful in appearance and is made from white Burmese Marble. That’s all for this edition young adventurers, fashion junkies, and thrill seekers. Remain cool, upbeat, and continue being well dressed. Till we meet again. One commonly heard expression concerning music is “what can’t be spoken is sung”, how true since most of us would never simply speak the words to our favorite songs as though we were having a conversation with ourselves. All of us have a favorite song and a favorite artist whose latest release we eagerly anticipate listening to. The language of music has varied dialects ranging from Pop, Rock, Techno, Electronic Dance Music (EDM), and Hip Hop just to name a few that are among some popular genres. For young lovers of music everywhere nothing celebrates the spirit of music better than music festivals where one has the privilege to listen to one’s favorite artist in person. 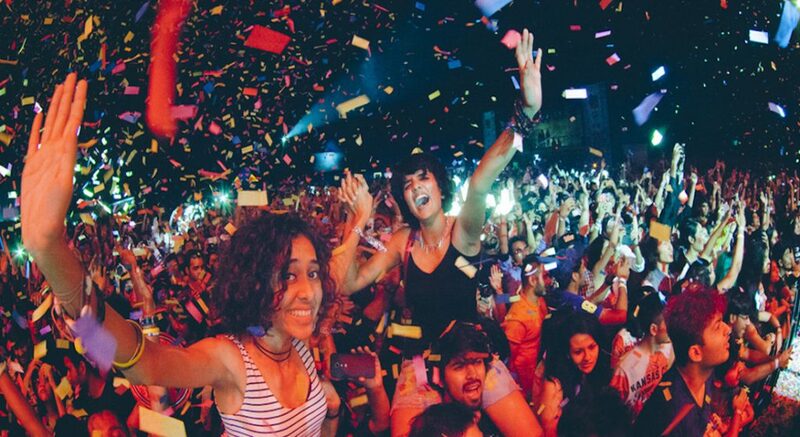 One of the most exciting upcoming music festivals is the Bacardi NH7 Weekender being held in Jaipur. This music festival has a reputation for bringing some of the strongest artistic talents from within India. The EDM artist Nucleya will be present in Jaipur on November 12th to mesmerize audiences with his hypnotic tunes. Another popular band called ‘The Local Train’ will be there as well. People enjoy listening to this band because it is easy and melodious to listen to and has catchy tunes they like to hum. Other artists, that might excite you about the NH7 Weekender this November are Ritviz, whom some of you may know is a DJ, singer, and dance music producer all rolled into one. Ritviz’s music attracts the audience because it has an eastern tinge with a heavy base. He’ll be an excellent complement to the other artists who will be in Jaipur within a few short weeks. The NH7 Weekender music festival will be held in Lebua Resort in Jaipur which is on Agra Road and Tehsil Ballapura, Jamdoli in Rajasthan. The best thing about this fest is that, you can enjoy all these with tickets just for 639 INR. The festival begins at 4:30 in the afternoon. Visitors simply must stay for the entire show as besides the musicians mentioned, there are a number of other top acts and in the past, the NH7 Weekender Festival has also had entertaining performances such as stand up, dance, and theatre. This year in Jaipur may be no exception. If you are one among many who simply love Electronic Dance Music, then your Mecca is definitely the upcoming Sunburn Arena. In the past Sunburn festivals, lineups have consisted of artists such as David Guetta, Martin Garrix, Armin Van Buuren, and Hardwell. From personal experience, this is the music festival for lovers of electronic and particularly of electronic dance music. The lineup this November in New Delhi on the 25th has one of the most popular DJ’s, KYGO who blew listeners away with his ‘I See Fire’ remix and made them a devout fan with Firestone. While the timing of this event has been fixed between 5 pm to 10 pm, the location is yet to be revealed. The event is being organized by Percept Live and tickets can be purchased online starting from 1997 INR for Early Bird Silver tickets and 2995 INR for Early Bird Platinum tickets. The premium Early Bird VIP tickets for this event are priced a nudge above 5K. These ticket prices may seem steep but the dance atmosphere at the event clubbed with the opportunity to dance to tunes by one of the best DJ’s in the world may make them worthwhile to many. Last and certainly not the least, the music festival that most has been eagerly looking forward to, is the Magnetic Fields Festival scheduled from 15th to 17th of December this year in Alsisar Rajasthan. Why this festival is the one people most look forward to is simply because of the large variety of artists scheduled to perform on stage. One of the music lover’s absolute favorite delights is DJ Four Tet who is scheduled to perform here as is drummer Jivraj Singh who is a part of the Calcutta indie music duo of Parekh and Singh. While Four Tet’s music repertoire is EDM and Jivraj Singh is a beat poet (drummer), the chance to listen to Four Tet and Jivraj’s beats in one music festival is well worth the approximated 10k minimum ticket price. For all the camp lovers out there, you will also get the chance to camp out in tents for the three-day Magnetic Fields Festival if you wish. Others who can’t give up the comfort of a mattress and air conditioning and who have a larger budget may decide to stay in Bedouin Tents or a Royal Palace. The living accommodations at the Magnetic Fields Music Festival are one of the most exciting features of this music festival.